Has winter arrived in your neck of the woods? As far as the weather goes, I’d say Michigan is a slacker this year. But that doesn’t deter me from making it feel cozy inside! 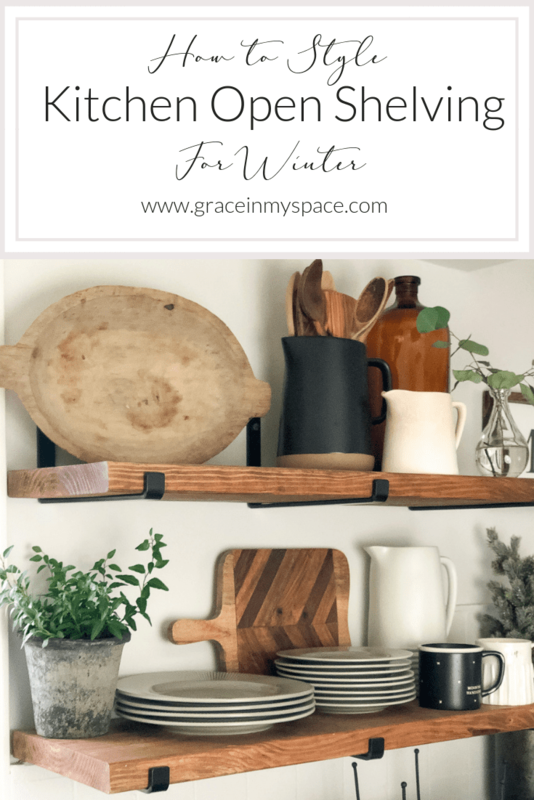 Today I’m sharing some easy tips for how to style kitchen open shelving for winter! Is it just me or do you crave simplicity after Christmas decor comes down? I get the feeling that it isn’t just me! I am a layer-er (yep…new word) by nature so of course my shelves are still layered. 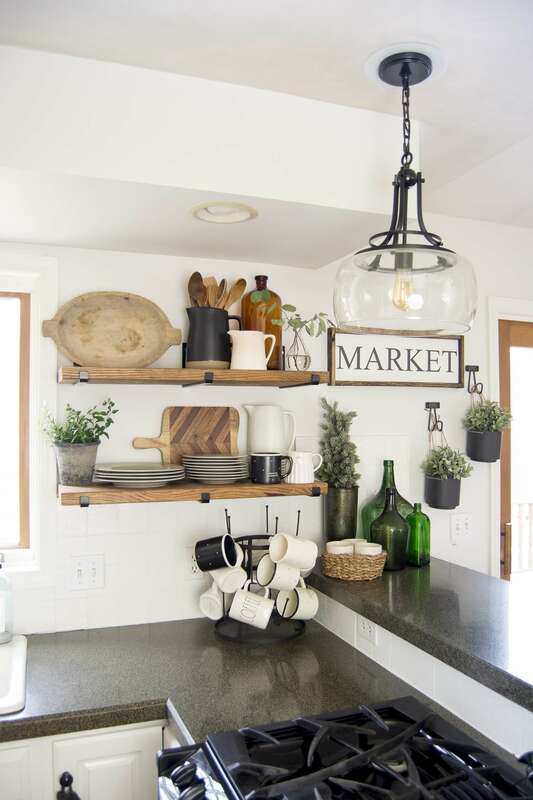 However, here are a few tips for decorating your kitchen open shelving for winter without adding a bunch of clutter! The very first thing I do is grab a cup of coffee and stare at my space. I know. It’s very technical. However, I think it’s a step most people overlook! I have a medium sized kitchen, but it often feels like I don’t have space for all the gadgets and gizmos. So I want my open shelving to have space for everyday items I use daily. That means that I must carve out an intentional space for them! In my kitchen, we use our open shelving to house plates and mugs that we use on the regular. So my first step is to place those items in an easy to reach place before I consider adding decor. My number two steps is to add your favorite item to ensure you have room for it. This is totally a personal preference, but for me it is plants. For you it may be a piece of art, favorite vintage find, decorative bowls, or a vase of flowers. 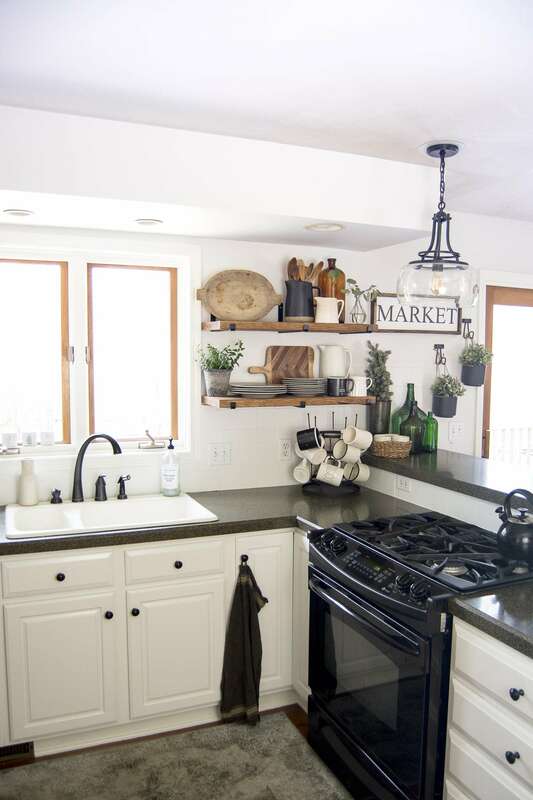 For your final decor additions to your kitchen open shelving you should think in layers. Notice I have layered thin items, like a cutting board, behind lower pieces to add height and warmth. And on the top, I use pitchers to corral a collection of vintage spoons. If it has a hole then it can hold something! So try to think beyond the traditional use of an item during this step. 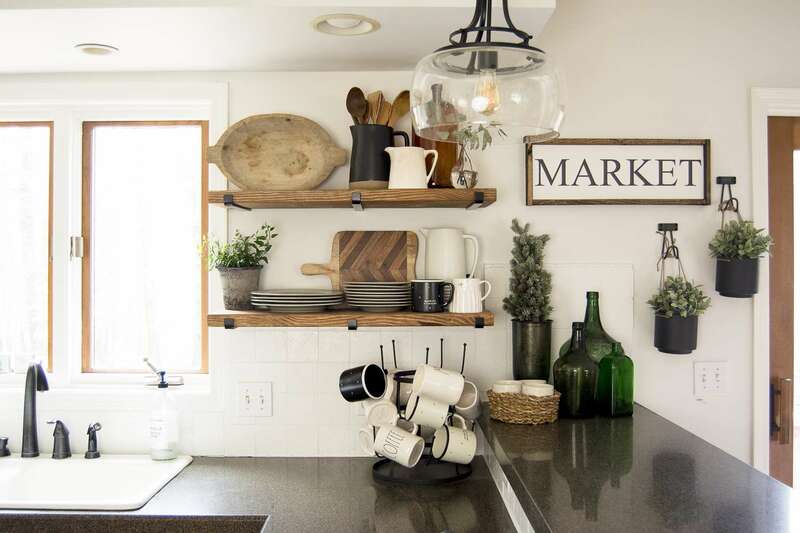 Here are a few final design tips, which can be applied to any type of open shelving. 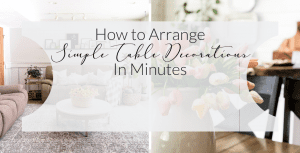 Whether you are using these in the kitchen, living room, or home office, they are simple tips to consider. Work in odd numbered groupings. See how the top shelf has a single stand alone bowl? And then next to it is a grouping of three, and then a single vase? And the same on the bottom shelf. One plant, a group of three, and then another group of three. It is more pleasing to the eye to group in odd numbers. I don’t know the science behind that, but it’s held true for years! Add black. Often people shy away from black accents because they don’t want to darken a space. However, adding pops of black is interesting, adds depth and drama, and draws the eye to the space. Vary the height of objects. For similar reasons as why to add black to a space, varying the height of objects is a great way to draw attention to your open shelves. It also helps carry the eye along the decor rather than focusing on one focal point. Ironically, I’m already itching to switch this space up for spring. Winter decor doesn’t last long around the Symonds abode as I long for warmer days, sunshine and happy pops of color. So stay tuned, I’m thinking this space will get a facelift in the near future. 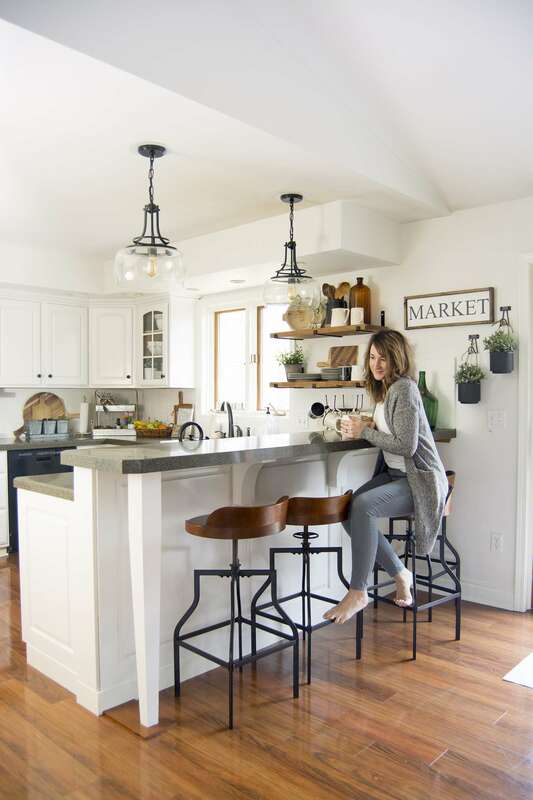 I hope this article was helpful to you as you seek to decorate your kitchen open shelving for winter! Make sure to follow along with me on Instagram for daily tips and a good laugh. I also pin daily inspiration to Pinterest! Let’s just cover all the bases, shall we? 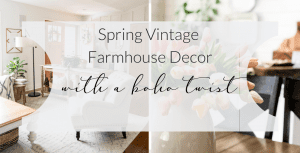 😉 I’d love for you to become a blog buddy and subscribe for weekly newsletters, free printables and coupon codes as well! I love your stools. Where did you buy them? Thank you! They are from Target but if you click the image under Shop My Kitchen they are linked directly. Thank you so much Becky! Open shelving in the bathroom would be a great addition! Hi Sarah! 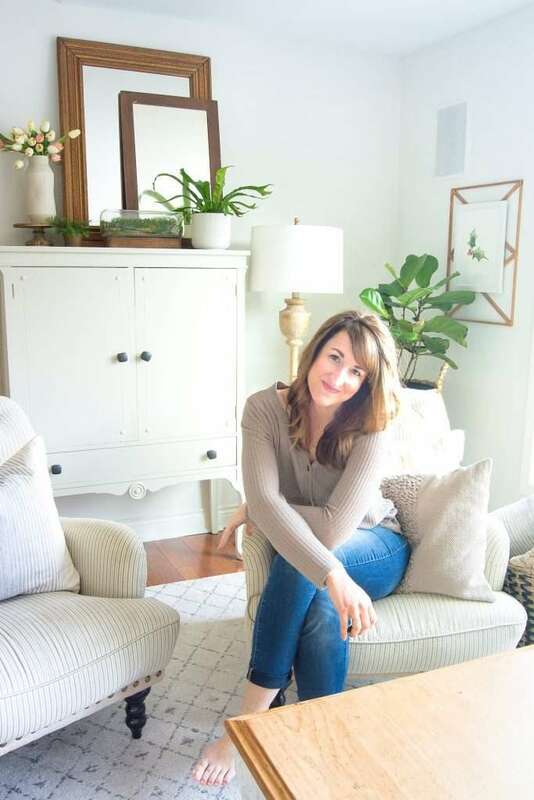 Just recently found your blog and it is such an inspiration in so many ways! Your kitchen looks amazing! 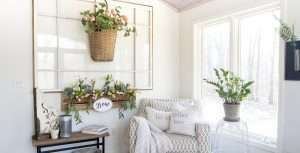 Do you know where you got the two hooks the plants are hanging from? Hi – I love the wooden shelves. Where can I buy them? Love it! 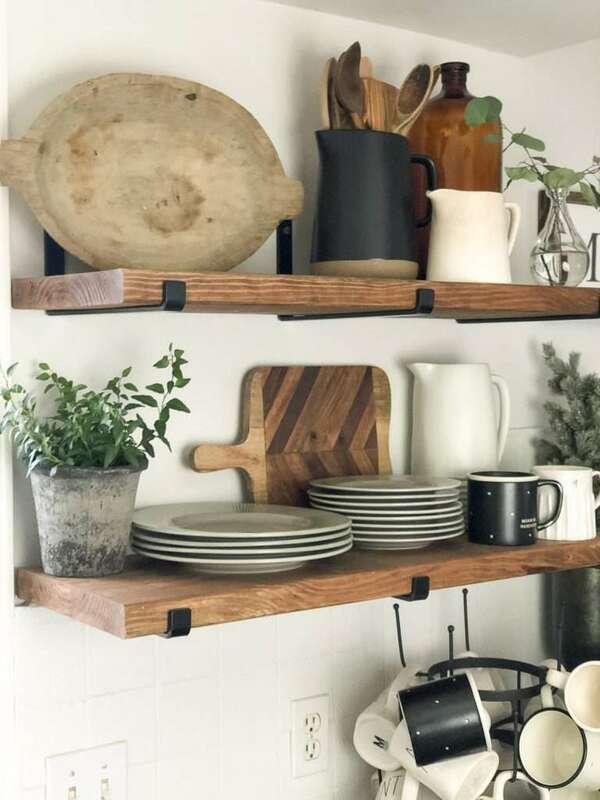 Where did you get those brackets to support the open shelves? Thank you! They are linked directly in the post from Cascade Iron Co.